13.12.2018 A new build of WPViewPDF V4 is available. It improves the way attachments can be added to PDF file – this requires the PLUS edition. 3.12.2018 WPTools 8.10 has been posted – most importantly Delphi 10.3 Rio is now supported. 24.10.2018 WPTools 8.06.2 has been posted. It includes two important improvements in the optional DocX import (image loading and default text format). The formatting of tables has been improved, the problem with unexpected page breaks has been fixed. 18.10.2018 WPTools 8.06 is available for registered customers. Among other things a possible range check error has been fixed, the text finder was improved. 16.10.2018 A new build of WPViewPDF V4 is available. This build solves a cache problem with the PrintHDC method. The font name property parameter of fields is now used. 10.9.2018 A new build of WPViewPDF V4 is available. Annotations which were marked to be hidden in their properties will not be displayed. 22.8.2018 A new build of WPViewPDF V4 is available. Among other this writing of checkboxes in PDF forms was improved. 20.8.2018 We posted a new build of TextDynamic 7. This new version fixes click issues on latest Windows 10. 23.7.2018 We posted a new build of WPTools 8 for registered customers. It improves the display of selections. 21.6.2018 WPTools 8.05 is now available as VCL demo – also includes demo word processor. 14.6.2018 WPTools 8.05 is available for registered customers. It contains 2 new demo projects, one to show how to use the improved owner paint events, the other to show the improved support for text boxes with the premium edition. Please see the included file history.txt for all changes. 8.6.2018 wPDF V4.60. It includes a revised font height calculation and improved baseline calculation for certain fonts when converted to Type3. The component now sends an error message event if the windows font embedding routine fails. In this case the internal fall-back subsetting is used. 21.4.2018 A preview EXE to show WPTools for Firemonkey is available on the Filebase. Please read more about the new word processing component for Firemonkey in our blog. 20.4.2018 WPViewPDF 4.5.2.3 is available now. Among others, it includes an improvement to CMYK image handling and support for XForms. 21.3.2018 wPDF V4.51 is available now. It fixes the problem that some fonts could not be embedded as subset. 8.3.2018 WPViewPDF 4.5.1.0 is available now. The new release improves rendering of certain PDF files, improves the position calculation of the text extracter and it is now also possible to read the XML metadata stored with a PDF file. 7.3.2018 wPDF V4.50 is available now. It improves the baseline calculation with text rendering. 5.3.2018 We have created a DBGrid for Firemonkey (FMX). This grid makes it easy to display the data from a TDataSource in a FireMonkey application. It also includes a designtime/runtime column designer and ist is also possible to create columns by code. 7.2.2018 WPViewPDF 4.4.4.0 is available now. The new release improves text selection and marking. 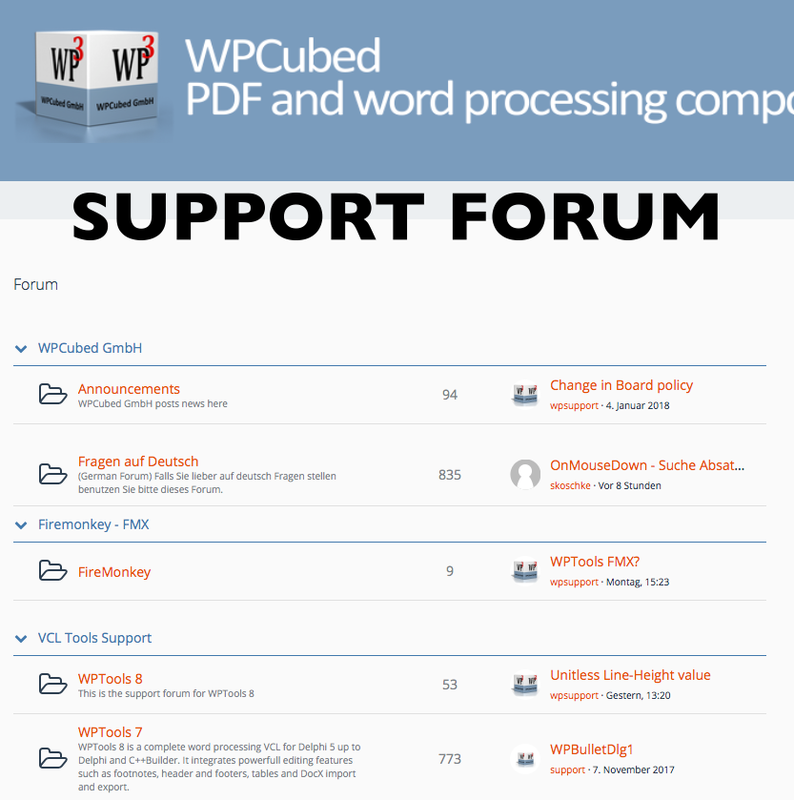 25.1.2018 Posted WPTools-FMX Teaser on our new support newsgroup. FireMonkeys around? 22.1.2018 WPViewPDF 4.4.3.3 is available now. The new release improves compatibility to PDF files which use image names which contain – signs. Also PDF-2 files are now accepted as input data. Please don’t miss out our new support form. We switched to a new technology end of 2017 and it is now much easier to use and better accepted.